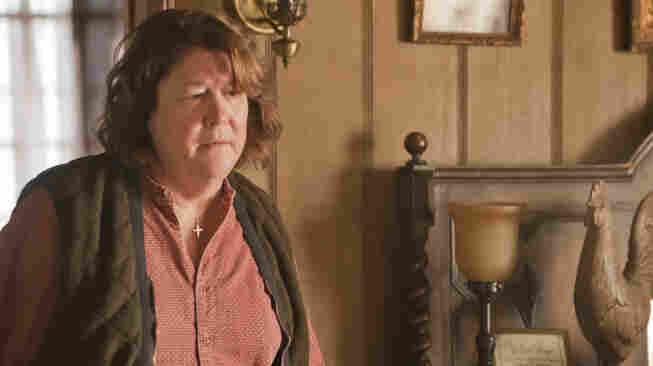 Margo Martindale: A 'Justified' Backwoods Matriarch Margo Martindale plays Mags Bennett, the leader of a law-defying Appalachian family in the FX series Justified. The Emmy-nominated actress talks about playing Mags — as well as her other roles in Paris, Je T'Aime and Million Dollar Baby. This week on Fresh Air, we're marking the year's end by revisiting some of the most memorable conversations we've had in 2011. This interview was originally broadcast on September 12, 2011. Mags, played by Margo Martindale, is a brutal woman — in one episode, she smashes her son's hand with a hammer for betraying her — but she also has a folksy side. She affectionately refers to her cups of bootleg liquor as "apple pie" — and when she smashes her son's hand, she makes sure to avoid his shooting fingers. Martindale, who is nothing like her character, tells Fresh Air's Terry Gross that she had a blast on set. "Everything about this part just came so easily," she says. "It was like doing a six-month movie, but it was easy — very easy." The veteran actress got the part, she says, while she was in Los Angeles to promote the movie Secretariat. "[My agent] called and said, 'They want to see you for this part — a Kentucky woman drug dealer,' " she says. "I said, 'Really? Do I have to audition for that? Can't they just look at my reel?' And he said, 'No, they really want you to say the words.' So then I got the script and read it, and I said, 'I'll go anywhere — anywhere — to do this. Just tell me where to go.' "
She spent six months on set, and says she drew inspiration for Mags from her roots in East Texas and Kentucky. "It's all part of my makeup," she says. "It's something I really understand. It just came out of my imagination and the 60 years I've lived. ... They just let me run wild. It was really, really liberating. ... I let everything go — everything except: I love to act, and I love to be honest and true to the character — that's all that I cared about. ... I care what I look like. I care that I'm fat. But Mags Bennett did not care. And I love that about Mags Bennett." Martindale was recently nominated for a 2011 Emmy Award for her role in Justified. She also received a 2004 Tony nomination for her role as Big Mama in Cat on a Hot Tin Roof. "The only thing that I like that I lose in those parts is a sense of humor. ... Some of those parts are funny — but only in how brutal they are. ... You can't be sophisticated in that way when you play those parts, but they've given me the most joy." "[Director and writer] Alexander Payne called me up and he said, 'Margo, this is Alexander Payne, do you remember me?' I said, 'Yeah.' He said, 'I've written something for you. I've never written for anyone before. And there's no money in it. Would you like to come to Paris and do it?' I said, 'Let me think about that — yes.' And then we hung up, and he called me back and he said, 'By the way, do you speak French?' And I said, 'Not a word.' And he said, 'Oh that's even better.' "
"I played Big Mama in Cat on a Hot Tin Roof when I was 20 years old at the University of Michigan. And then I played Big Mama on Broadway in 2004. The speech at the end of that play — 'Time goes by so quickly ..." — boy did that have different weight from when I was 20 years old to when I was 50-something-odd years old. It's all about what you've experienced. You can't teach that to a younger actor. You have to have lived that."